Siga IDE provides ability generate code to perform following operations on a DynamoDB resource(table). When injecting a new operation, user has the ability to either create a new DynamoDB table or to use an existing DynamoDB table which is accessible by the current user credentials. 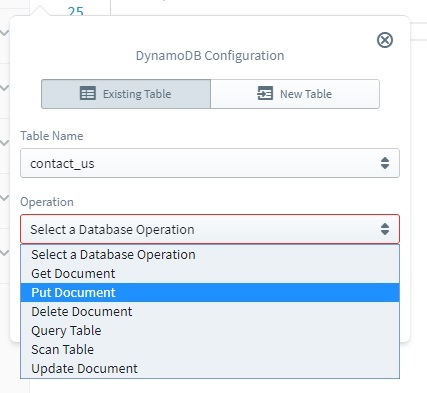 Inorder to start with DynamoDB, user has to drag DynamoDB tile to the code editor from the resources panel. Then user may choose either New Table or Existing Table option based on the requirement. If it&apos;s required to execute an operation on a table which is already exists, first user should select the Existing Table mode tab. Then existing table names will be listed in the Table Name drop down list. User can easily select required queue from that drop down list. In the existing table list, a union of following table sets will be visible to the user. Tables already exist in AWS account of user. Tables which have been previously created in the same project. If it&apos;s required to execute an operation on a newly created table, first user should select the New Table mode tab.\ Then required parameters should be configured for the queue which is going to be created and invoke the required operation. 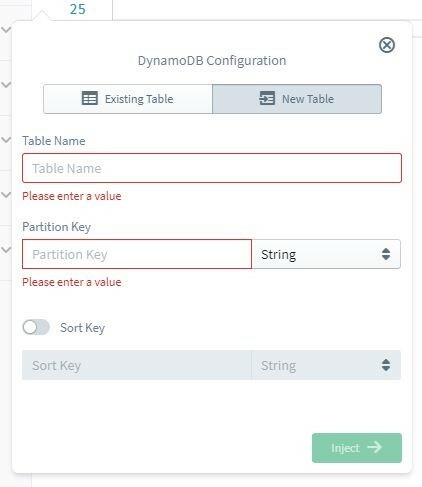 Once you create or select a valid DynamoDB table, then an option will be visible to select the intended DynamoDB operation. This operation can be used to either create a new item, or to update an existing item. Values A list of attribute:value pairs where, attribute is the name of the field and value is the intended value for that field. This operation deletes a single item from the table, when Primary Key of the item is given. This operation edits an existing item in the table, or create a new item if specified item is not existing. THis operation can be used to retrieve a list of Items which meets a specified condition. This will iterate over all the elements in the table to compose the results, since it is not required to short list Item set by primary key in Scan operation. This operation can be used to retrieve a list of Items by specifying Partition Key and a condition for Sort Key or secondary index.